This guest post is by IFBC19 sponsor Alaskan Brewing Co. The Alaskan Brew Crew is excited to be a part of the International Food Bloggers Conference coming to our little Southeast Alaskan city! Like food bloggers’ passion for great food, we’re passionate about great craft beer. We’re all about creative brews, pioneering innovative, sustainable brewing processes, and a zest for life in Alaska. Here’s how it all started: In 1986, Geoff and Marcy Larson decided to open a brewery as a way to stay in the beautiful state they had fallen in love with. While researching brewing in Alaska, Marcy came across a turn-of-the-century recipe developed during the Gold Rush in an old brewery’s shipping records. After Geoff homebrewed a batch, they discovered that Gold Rush-era miners had great taste in beer! That beer is now known as Alaskan Amber. With Amber as our flagship brew, Alaskan Brewing became the 67th independent brewery in the country and the first brewery in Juneau since Prohibition. Since then, we have grown to become one of the most award-winning craft breweries in the history of the Great American Beer Festival and expanded distribution to 22 states (so far)! We’re not only inspired by Southeast Alaska’s rich history, but also by its rich environment and abundant wild ingredients. From glacier-fed water, to malt smoked over local alder wood, to the citrusy spruce tips that emerges from the branches of Sitka spruce trees in the spring, we love to incorporate local flavor into our brews. Fittingly, our brews are known for how perfectly they pair with local dishes and for being a delicious addition to recipes. Smooth, balanced and malty Amber is famously the perfect accompaniment to local, freshly-caught seafood such as king salmon and crab, while the dark, robust, and smoky Smoked Porter is delightful with smoked seafood, cheese and other hearty foods. Local foodies continually find creative ways to incorporate our brews into recipes such as Alaskan Amber-battered halibut or Smoked Porter cheesecake (trust us – it’s amazing). 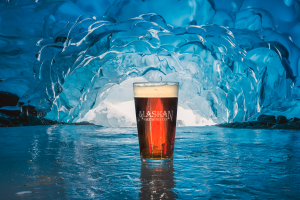 The Alaskan Brew Crew will be pouring samples throughout the conference and at the Taste of Juneau – we’re excited to meet you all and talk beer! If you’re into craft beer, don’t miss the opportunity to visit our brewery to check out our beautiful new expanded tasting room, sample our wide variety of brews, and see where the magic happens! We’ll see you there!